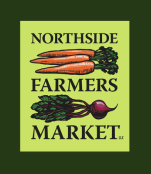 The Northside Farmers Market is partnering with Apple Street Market, a worker and community owned grocery store, hoping to open next year in Northside, Cincinnati. It's a major community project, and a much needed one; Northside qualifies a food desert, meaning that many of our residents who don't own a car and have a difficult time obtaining groceries. Apple Street will have a booth at the market to sell coop shares and answer any questions. The goal of this project is to make healthy foods more easily available in our neighborhood and to support and promote the opening of Cincinnati's first worker owned grocery store. Apple Street also distributes shares of produce from Our Harvest.